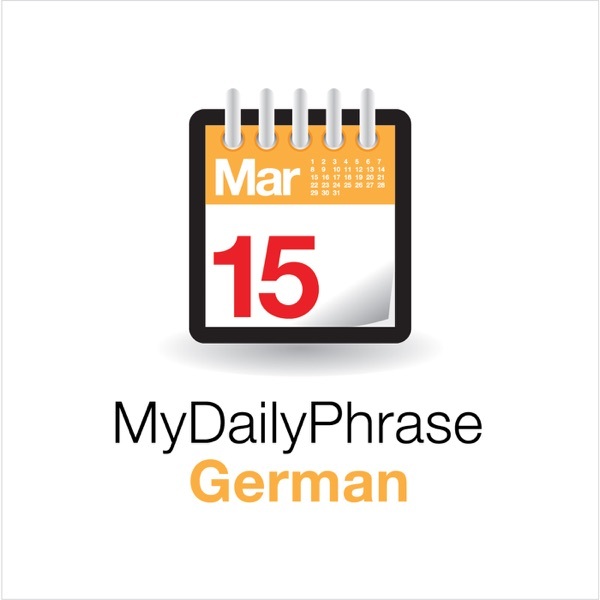 My Daily Phrase German | Listen Free on Castbox. Happy European Day of Languages to all our listeners! By way of joining in this international celebration of languages and language-learning we're delighted to introduce eight new podcasts today. We're adding Catalan, Danish, French, Japanese, Mandarin and Romanian to our One Minute Languages series; we're introducing our first podcast for English learners - Write Back Soon will help learners master Phrasal Verbs; and we're finally announcing the long-awaited sequel to Coffee Break Spanish: it's Show Time! One Minute Languages Courses are now available as premium podcasts with lesson guides and enhanced podcasts. In this edition: Radio Lingua Store sale, details about One Minute Irish, plans for 2008 and exciting news from iTunes Best of 2007 lists. Bonsoir, Guten Abend, Buenas tardes, Buona sera! This is Mark from the Radio Lingua Network and I'm here to bring you some of the latest news about our language-learning materials.Since our last news podcast there have been quite a number of developments here at Radio Lingua. So much is happening we've decided to streamline our news a little and in addition to our news podcast which is released every month, we're now producing an email newsletter. If you'd like to sign up to the newsletter, visit www.radiolingua.com/mailinglist and add your details. In addition to keeping up to date with developments you'll also receive exclusive discount codes for our store.At the beginning of this month the whole team was down in London at the Language Show. We thoroughly enjoyed the three-day event and were delighted to meet many of our listeners who had come along especially to say 'hello'. Some of our listeners even volunteered to have their photos taken, so visit our website and click on our new Photo Gallery to see these. Our iPod competition was won by Hannah Bond from Staffordshire. Hannah wins an iPod nano preloaded with our entire library of podcasts. Congratulations to Hannah.This week, Kara and I were in Cardiff to collect a European Award for Languages in recognition of the success of Coffee Break Spanish. The European Award for Languages is a Europe-wide initiative supported by the European Commission which recognises innovative, effective and replicable approaches to language learning. The event was held at the Millennium Stadium in Cardiff, and the award was presented by Isabella Moore, CEO of CILT, the National Centre for Languages. You can watch the video podcast we filmed during the day over on our YouTube Channel, that's at www.youtube.com/radiolinguaFinally in tonight's news podcast I'm bringing you news of a new development for Radio Lingua: we're launching a brand new podcast tomorrow - that's Monday 27 November - which will teach you basic Polish in short weekly programmes. And when I say 'short' I mean short! Here's Ania to tell you more about 'One Minute Polish'.And that's it for this edition of Radio Lingua News. We'll be back soon with details of our Holiday sale in the store. In the meantime, thanks for listening! Learn German step by step, day by day, phrase by phrase. In the final lesson of our course you'll go through some of the content covered in the past 100 shows and learn a few final phrases to set you on your journey to a German-speaking country. Spend 5 minutes withus and gain confidence in speaking German with our 20-week course. Youcan automatically download each new episode for free by subscribing in iTunes.Please visit our website for more information. This is Mark from the Radio Lingua Network and I'm here to bring you some of the latest news about our language-learning materials. It's been a while since we released a CBS news podcast, and there's just so much happening just now we thought it was time to add this news podcast to all our feeds to bring you the latest information. This news programme will be added to all our podcast feeds to make sure everyone hears about what's happening, regardless of which language you're learning with us. There's also another reason why we wanted to release the news podcast today, but more about that in just a moment!First up today is the news that Coffee Break Spanish has won a European Award for Languages. The award recognises "creative ways to improve the quality of language teaching, motivate students and make the best of available resources". It's a Europe-wide initiative supported by the European Commission. The UK co-ordinator of the initiative is CILT, the National Centre for Languages. In total 15 initiatives were recognised involving language-learners of all ages. According to the judges, "the success of Coffee Break Spanish across the world shows that podcasting can promote language awareness and competence regardless of geographical location". Kara and I will be at the Millennium Stadium in Cardiff on 20 November to accept the award. We'd like to take this opportunity to thank everyone for their support of Coffee Break Spanish, and we're looking forward to the new season beginning in a few weeks. All the Coffee Break Spanish news can be found at www.coffeebreakspanish.comFinal preparations are underway for our launch of Coffee Break French next week. The French team is heading out to Paris this weekend in preparation for the launch. The Coffee Break French feed is already live and you can subscribe to it in iTunes or via the website. Prior to the launch we've been releasing promo shows about Coffee Break French and there will be another one of these later this week explaining what the course will involve. Coffee Break French goes live at 18h00 on Wednesday 26th September when we'll launch with a video introduction from Paris. While in Paris we'll also be working on something else, but at this stage we'll have to keep that top secret! More information in the coming months!We're going to be making some changes with the Coffee Break Spanish premium service. Within the next couple of weeks we're going to be introducing a new way of accessing the premium materials, rather than using the subscription method. Current subscriptions will remain in place, and it will still be possible to sign up for 3 month subscriptions, but the new store which is currently in development will allow listeners to purchase whole units for one-off costs. We'll be able to accept payment by credit card rather than Paypal only, so hopefully this will be good news for many of you. The same system will be used for our other podcasts. Now for a quick roundup of where we are with our podcasts. CBS episode 40 is about to be released and features a discussion about languages and language-learning in Spain. There's even some Catalan thrown in in this week's show. We'll be taking a couple of weeks off with CBS while we launch CBF, but we'll be back with unit 5 in early October. MDPG is about to finish. We're going to be releasing the final materials in this series in the next few days. Our plans are to remove all the content of MDPG and MDPI from the feeds in November and then start the courses again with some updated extra materials. Many listeners have been asking us about higher level Italian and German courses. We'll be introducing a new German course in the winter and we're currently planning more Italian content for early 2008. We'll take this opportunity to mention that we're also developing short courses in other languages including Polish and Norwegian. These will be made available over the coming months and you'll hear more about them in future news podcasts.And finally... if any Scottish educators are heading to the Scottish Learning Festival this week then do come along to the Apple stand where I'm going to be demonstrating podcasting along with Kara. The Scottish Learning Festival is a major event in the educational calendar in the UK welcoming tens of thousands of educationalists from across Europe. Find out more at www.ltscotland.org.uk/slf. You can also subscribe to the SLF Connected Live podcast in iTunes.And that's it for this edition of Radio Lingua News. We'll be back in a couple of weeks after the launch of CBF. In the meantime, thanks for listening. Learn German step by step, day by day, phrase by phrase. In today'sshow you'll be learning how to say it's been nice to meet someone and suggest you keep in touch. Spend 5 minutes withus and gain confidence in speaking German with our 20-week course. Youcan automatically download each new episode for free by subscribing in iTunes.Please visit our website for more information. Learn German step by step, day by day, phrase by phrase. In today'sshow you'll be learning how to exchange email addresses and cellphone numbers. Spend 5 minutes withus and gain confidence in speaking German with our 20-week course. Youcan automatically download each new episode for free by subscribing in iTunes.Please visit our website for more information. Learn German step by step, day by day, phrase by phrase. In today'sshow you'll be talking about things you like . Spend 5 minutes withus and gain confidence in speaking German with our 20-week course. Youcan automatically download each new episode for free by subscribing in iTunes.Please visit our website for more information.